Bespoke bathrooms – Lisa Milbacher encouraged us to join her last year in a drive to provide toiletries for the people at the Night shelter which we did. 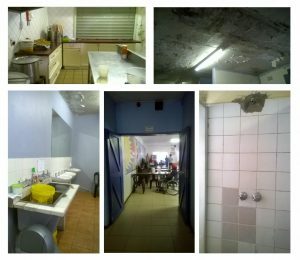 We visited the night haven shelter in Green point on Monday – Mandela Day. They have capacity for 60 people and were overfull with 96 people. On the way there we stopped to give a young women on the street a night shelter card and she explained that she went every day and go a shower and a meal but there was no bed for her and she was just trying. We and one of our fellow companies – Bespoke Bathrooms bought and dropped off toiletries for everyone at the night shelter and did a walk around. The conditions are so very sad and a poor reflection on how we – unknowingly alienate and neglect people in need. The men’s bathroom does not even have shower heads. The people who work there have an excellent spirit and they do a great deal of good. Click here to go to their website. We have committed to start working on the project next week with Bespoke Bathrooms to assist to gather materials from suppliers, contributions from various sources and assist to upgrade what is there. JMA will also measure up and draft a master plan for possible future extensions should the funds becomes available. We have client and project portals on our website. These are useful repositories for information, design discussions and sketch design/inspiration. We also use these portals when a project goes onto site for site photographs site minutes etc. It means a central source for important information and not having to go back to files or go through emails for information. We are now expanding this to enable clients to define their accommodation schedule and brief on the website. This is only shared with the agreed/select group. The Site Rights and Constraints (title deeds survey data etc) will also be summarised on the website and the client or client representatives can upload the relevant documents here. We also plan on an “Inspiration” portal similar to pinterest or dropbox and are busy working on this format. We will be test driving these with some of our projects and appreciate any feedback. We are making progress… Watch this space..